Apostrophes are used to shorten some words which are referred to as contractions. 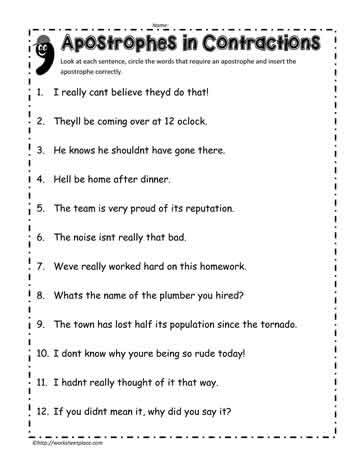 Here are some examples of apostrophes used in contractions. I really can?t believe they?d do that! They?ll be coming over at 12 o?clock. He knows he shouldn?t have gone there. He?ll be home after dinner. The team is very proud of its reputation. The noise isn?t really that bad. We?ve really worked hard on this homework. What?s the name of the plumber you hired? The town has lost half its population since the tornado. I don?t know why you?re being so rude today! I hadn?t really thought of it that way. If you didn?t mean it, why did you say it? Free contraction and apostrophe worksheets with answers.